JOBZ! ® is the only truly comprehensive software solution for printing and packaging sales. JOBZ! manages contacts, communications, proposals and projects. • Dashboard view your day. • Specify and quote complex projects. • Handle schedules and deadlines. • Communicate with customers and production. • Manage an entire sales force. JOBZ! helps print reps be awesome at selling printing. JOBZ! helps sales managers be awesome at managing print reps.
No generic contact manager comes even remotely close to JOBZ! in addressing the specific needs of printing sales. JOBZ! has been in active use and continual development since the early 1990’s and is used by many famous companies. CUSTOMER RELATIONSHIP MANAGEMENT puts you in control of communications, and enables contact tracking, reminders and profiling. Contact information is linked dynamically with job correspondence. Merge-mail or export contact data to Variable Data presses. Extreme personalization at the company and individual user level. Email, PDF, and Google Maps integration. LAN and Remote access workgroup collaboration. Confidential access by sales rep, with job team privilege settings. Commission visualization during the customer pricing/proposal process. Field checking helps ensure that complete information flows to Estimating and Production. Commercial Print, Digital, Envelopes, Wide Format, Flexible Packaging and Corrugated or Folding Cartons Specs. Line-item Campaign projects with multiple components. Annual Sales Budgeting and tracking actual sales against budget. An intuitive user interface guides the user through specifying, quoting and managing custom printing projects, preparing numerous essential documents with no redundancy and with the greatest possible detail. Contact information is linked dynamically with job correspondence. The entire workflow of the sales process is covered, from Request for Estimate through Invoice Draft. Data entry shortcuts can be personalized for each user. Field checking helps ensure that complete information flows to Estimating and Production. Email communication of all documents and reports is integrated, with PDF files created and/or appended, saved locally and automatically attached to email messages. Customer-facing documents include full-color logo letterhead, personal signatures and individualized return-address information. Multiple corporate identities may be selected, enabling representation of affiliated companies. Contract terms & conditions may be personalized by management. Proposals are legally binding. Commercial Print, Digital, Envelopes, Flexible Packaging, Corrugated or Folding Cartons, and Wide Format may be specified easily, with shortcuts for sizes and styles, substrates etc. that are unique to these specialties. The Campaign job type can contain any number of line items, each with individual specs and pricing. Generic (non-print) jobs may be handled as well. Mailing and Distribution workflow is fully enabled. Digital short-run (quick-order) work may be handled efficiently with templates and a pricing calculator. Jobs may be combined in projects and quoted in matrix/spreadsheet summary form. An emailed JOBZ! estimate request is formatted to paste directly into shop systems, so that sales-entered data flows through the estimate and job ticket process. Strategic pricing capabilities include commission visualization during the customer proposal process. Use the optional JOBZ! Ticket to empower Production to create a document that takes the job right through Manufacturing and Shipping, preserving the exact sales-entered job specs, requirements, and delivery instructions, with prepress, paper, presswork and finishing details added. Print shipping labels and packing lists for every destination specified by sales, with carton counts and quantities per carton. A complete brokerage workflow is available, involving multiple estimators, vendors and purchase orders, then calculate commission splits with the house. A complete profile of a customer or prospect can be kept in JOBZ! In addition to the basics, this information can include at least 5 categories of management-defined classification, such as company type and market segment. Simple button-click contact histories keep a record of when they were last called, what transpired, and what should be the focus of the next call. Sorting routines and calendars help ensure follow-up. A Google Map of any contact's location may be displayed with a click. The contact information is useful to the sales rep not only for prospecting, but saves time in the course of generating proposals and work orders, since it is all linked to the jobs module. For each of their contacts, a sales rep makes a sales prediction. This prediction can be as detailed as month-by-month, plant-by-plant and press-by-press, and can include a plan for achieving this goal. The amounts roll-up to a company-wide budget. A number of management reports are available, with varying levels of detail and sub-summary, including multiple sales organizations. Multiple buyers at a single company can each be targeted individually and rolled up. JOBZ! displays Budget vs. Actual Year-to-Date and trailing 12 months sales at the individual contact level so the sales reps can keep their eyes on the prize. Sales management is accomplished through several capabilities of JOBZ!, including those listed above and by using the contact management module. Sales reps enter contact information in the course of quoting jobs and prospecting. This information is then used by managers to understand who is being called upon, how often, and how successfully. A sales rep can easily determine if a potential prospect is already being called on by another sales rep. Accounts and prospects may be challenged by other sales reps, and easily reassigned by the manager. When a sales rep leaves the company, the contacts may be distributed among the other reps or given to a new rep. Numerous documents and lists can be generated from this database of people, including mail-merge letters, labels, envelopes and postcards- even personalized mass email campaigns can be conducted, and each recipient’s contact history can be updated accordingly. Because each contact may be classified in a number of ways, highly targeted marketing promotions are possible. Data can be easily exported in spreadsheet format to drive variable data presses. In addition to all the correspondence listed above in the job and contact management modules, there is an entire database devoted to memos and letters of various formats (including this!) These have the same Graphically Formatted Document features described above, and are linked to the other modules. For example, while viewing a contact record, you have a window into all the correspondence you have ever sent to this person, listed by subject and date. Just click on it to go to it. A Template feature allows the users to select pre-composed correspondence created by managers or skilled writers. Nobody likes doing expense reports, but this part of JOBZ! makes it as easy as it can get. It's conveniently linked to a sales rep's contacts, and completely configurable to your needs. You specify an expense at a time, using a minimum of fields (who-what-when-where-why), most with dropdowns to speed data input. Then you choose a report by clicking a button, indicating the month and year, and a completely formatted, sorted, subtotaled report prints out, dated and ready for signatures. 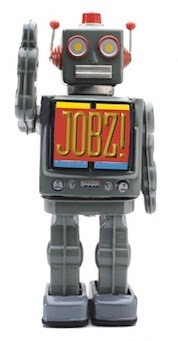 The best feature of JOBZ! is its long pedigree of development and use, which have honed the program to such a sharp edge that it can truly be said that JOBZ! is the best tool ever designed for selling printing. Our mascot, the sales force automaton.